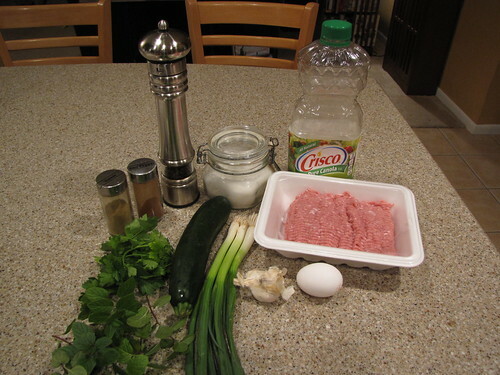 Turkey & Zucchini Burgers. Oh, with a bonus of creamy Tzatziki Sauce. SO good! This recipe comes from the Jerusalem Cookbook that was all the rage (with good reason) last year. Full of interesting recipes and stories from regions in the Middle East, it won just about every award a cookbook can win. I was going to save this recipe for the upcoming Zucchini Season but it’s too good to wait. We all know that turkey burgers can be boring and dry. Well not these babies! Zucchini keeps them moist and a whole bowlful of green herby goodness adds tons of flavor. I put a little (okay, a lot) of Greek Tzatziki Sauce on the side. You know, that sauce that comes with Gyros. Not exactly in the same country as Jerusalem but close enough and plenty tasty. Ground Turkey, Zucchini, Green Onions, Garlic, Fresh Mint, Fresh Parsley (or cilantro, or both), Egg, Ground Cumin, Ground Cayenne Pepper, Vegetable Oil, Salt & Pepper. For the sauce you need Plain Greek Yogurt, Sour Cream, Cucumber, Garlic, White Wine Vinegar, Salt & Pepper. The Tzatziki was a last minute addition so it didn’t make it into the photos, but it’s easy to make. I’ll add the recipe and ingredients at the end of the post and also on the printables. 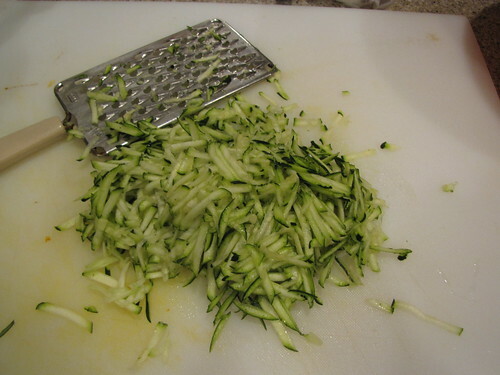 Grate one medium zucchini to make about 2 cups. 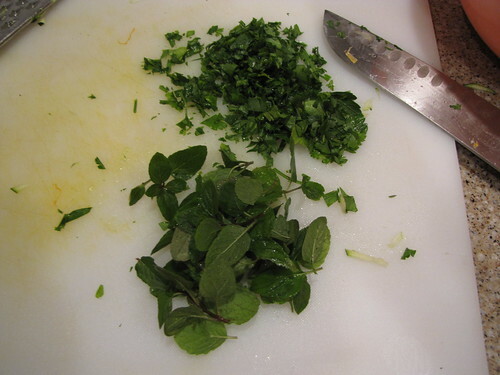 Finely chop 2 Tablespoons of fresh mint leaves and 2 Tablespoons fresh parsley or cilantro. The recipe originally calls for cilantro but I was out. Also I know there are cilantro haters out there so trust me that parsley is a good substitution. In the future, I will probably add BOTH parsley and cilantro. The more green stuff, the better. While you’re chopping, finely chop 2 cloves of garlic. Place 1 pound (or slightly more) ground turkey in a large mixing bowl. My store sells turkey in packages of about 1¼ pounds so I just used the whole thing. Anything between 1 and 1½ pounds should be fine. Personally, I prefer the ground dark meat turkey over the all white meat as it has more flavor and helps the turkey burgers to stay moist. 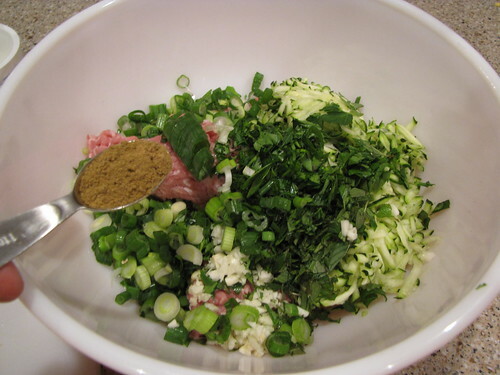 Add the shredded zucchini, chopped parsley and mint, 2 cloves of chopped garlic, and 1 egg. 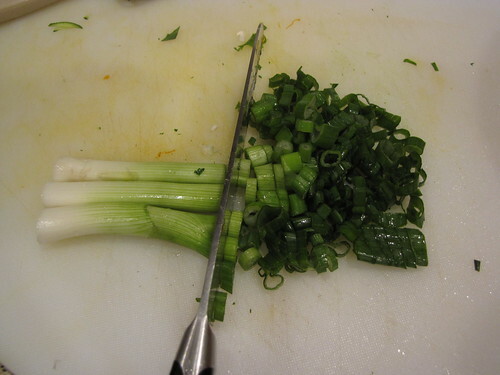 Finely chop 3 green onions and add them to the bowl. Use both the green and white parts. 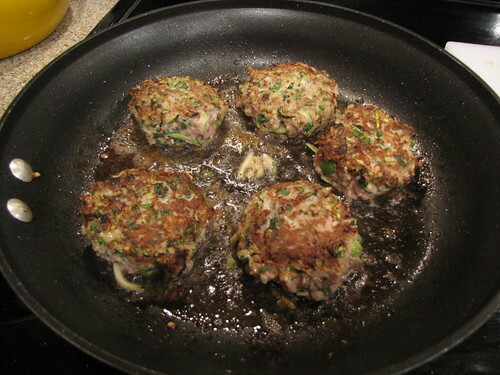 Season the turkey burgers with 1 teaspoon cumin, ½ teaspoon cayenne pepper, and salt & pepper to taste. Get in there with clean hands and mix it all together. It will be quite lumpy because of all the veggies but that’s okay. Shape into 10 medium sized patties. I used my large size, 2½-inch ice cream/cookie scoop. You want burgers that are smaller than a standard hamburger so that they cook quickly and don’t dry out. Think turkey & zucchini sliders. Put enough vegetable oil in a large skillet to make a thin layer in the bottom of the pan. I used about ¼ cup oil. You don’t need these drowning in oil as they will finish cooking in the oven. Carefully transfer the burgers to the hot oil and brown on both sides, about 4 minutes total. Brown the burgers in batches so you don’t crowd the pan and also to make gently turning the burgers much easier. 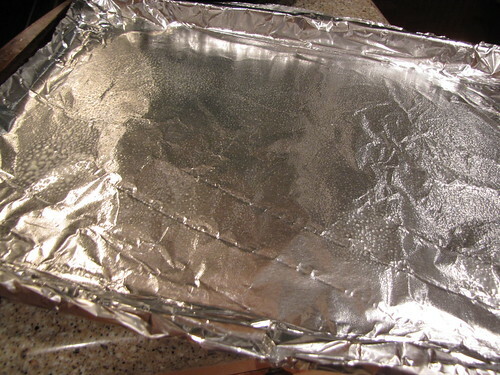 Transfer the golden brown turkey & zucchini burgers to a foil lined baking sheet that has been lightly oiled or coated with non-stick cooking spray. Bake at 425 degrees for 7-10 minutes until cooked through. 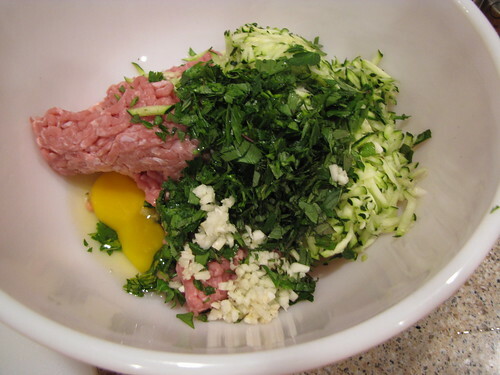 To make the Tzatziki Sauce, combine 1 cup plain Greek yogurt and ¼ cup sour cream in a medium bowl. Peel and seed 1 medium cucumber or ½ hot house cucumber (those giant long ones usually wrapped in plastic). If you are using a hot house cucumber you don’t need to remove the seeds. Sometimes I don’t even bother to peel them if they are light green and nice and tender. 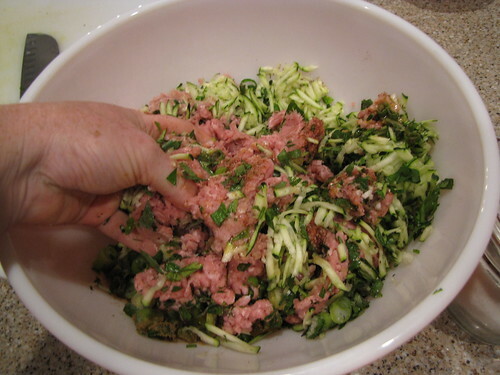 Grate the cucumber and squeeze out as much of the liquid as possible with your hands. Add the cucumber to the bowl and add 1-2 cloves of garlic that have been squeezed through a garlic press or very finely chopped. Season with 1 teaspoon white wine vinegar and salt & pepper. That’s it! 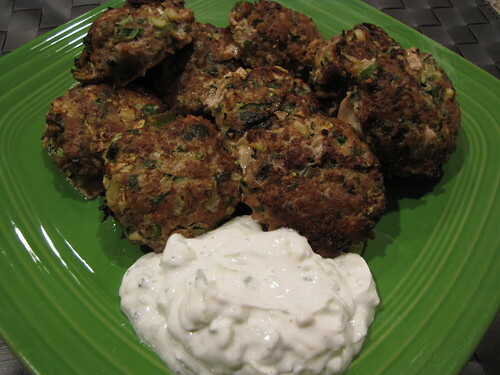 Serve the turkey & zucchini burgers with a nice big dollop of tzatziki on the side. It’s nice to have healthier alternatives to regular old burgers and to mix things up with some new flavors. Whatever you do, don’t skip the mint in this recipe! I think it’s the secret ingredient! 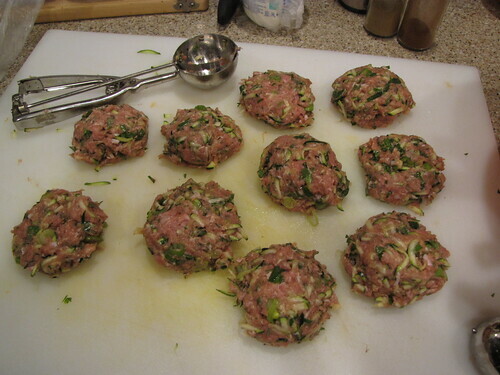 We had these for dinner but I think you could also make these meatball sized and really knock your next cocktail party or appetizer tray out of the park. Speaking of the park, remember these babies for summer. Zucchini season isn’t that far away! These do look amazing. We love turkey burgers and we love the zuch…this looks like a delish and kinda healthy option to regular burgers that my carnivore loves! !